Our tame beekeeper moving our observation hive. Photo courtesy of Market Hall Museum. On the morning of the 9th September our tame beekeeper came to take the bees on holiday while we are having our refit. As all of the galleries will be totally cleared and new cases installed, this would be too much disturbance for the bees – so the beekeeper is taking them to his garden, where he will put them in a standard hive to keep them cosy for the winter. In a normal hive in summer you will have up to 60,000 bees, all working together to expand the colony and collect food. In winter the colony hibernates and that number will drop to around 10,000 individuals. In the flowering season a bee works so hard that they only live about six weeks, but over winter they do not fly much they have less work to do so they can live up to six months. They will eat the honey that they have built up over the rest of the year, and sometimes the beekeeper will give them extra food to make sure they survive. 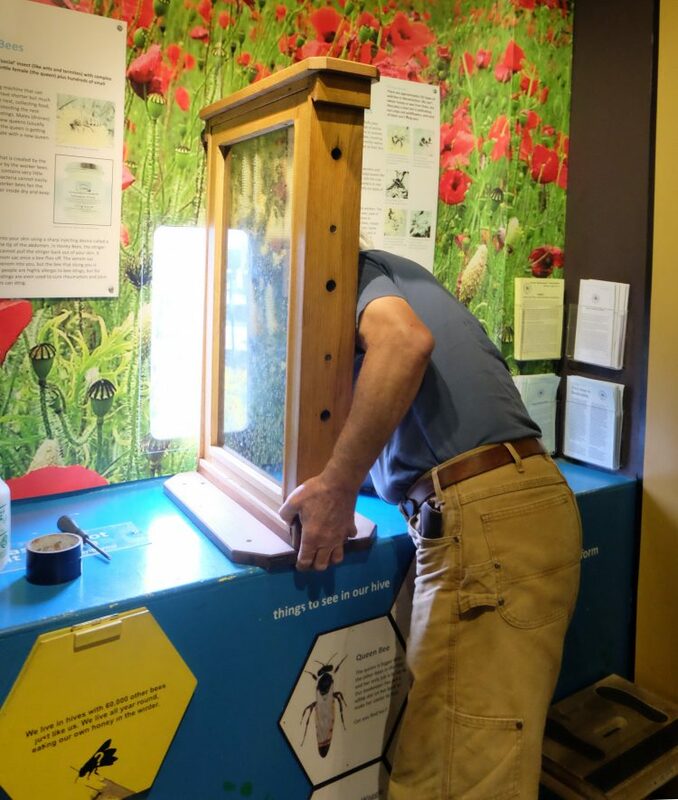 Our observation hive was made especially for the museum over 80 years ago. The way the honeycomb is vertically stacked is not the way that bees would normally nest, but it is very interesting to be able to see their behaviour, like the waggle dance1. Over the years the people of Warwickshire have become very fond of our bees, so we will definitely be bringing them back. Bees are crucial pollinators of our food crops, so it is important that people can learn about them and see how they live. 1The ‘waggle dance’ is where bees will shake and dance about. You will quite often see them shaking their bottoms near the entrance of the hive. How they move tells other bees where to find good sources of nectar and pollen.